We will now be offering all courses with an option to split them so you come and take part of it one week and then return the following week, a few weeks later, or even a few months later if you prefer to complete the course. It may not be the best name to give the course as it does not need to be exactly half and half as we can be flexible to a certain extent. Long courses can be exhausting for some people, so this will break it up and give you a chance to rest and take stock of everything before you return to finish off. It is sometimes difficult to work out exactly how long a course is needed so this way you can do part and then adjust the second half to exactly suit your needs. Some people find it difficult to take time off work so you can arrange things a lot easier around work commitments. It is also great if you are not sure if an intensive course is for you, just book a small course to give us a try and see how you get on! 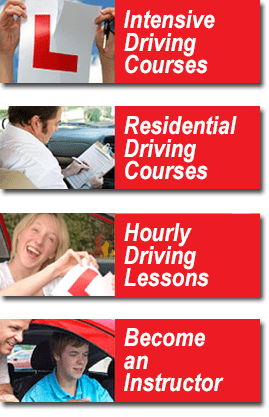 You can then book a course for the balance of your driving requirements when you have seen how well you did! Remember, you have nothing to lose as if it turns out it is not for you then at least you are many weeks closer to passing your test anyway! We can only see one and that is having to make another journey to us if you were doing residential. This is not actually that bad as you will save a night at the accommodation so that is £40 towards your travelling costs. It might even work out cheaper for you! We do not charge any more for this service so for residential courses it is the normal price of any course less £40 (the one night that you save at the accommodation), so as an example the 40 hour course is now £1445 instead of £1485. You can also do just how many hours/days you want to start with (subject to our availability) but as there are so many options it is best to contact us for a price. For non- residential courses the price remains the same however, as above, you can book as many hours as you would like as the first part of the course.